This week is our tenth wedding anniversary, a significant milestone for us. Being the authors of Radical Marriage it seems a good idea to share where we are now and where we’re headed. In 2008 when we were married it was my third marriage and Darlene’s second. Her kids were grown and out of the house and we became a blended family with two of my kids who still lived at home. Darlene was a Registered Nurse who worked at the VA and I worked full time from home running Relationship Coaching Institute (RCI). Two years later Darlene decided to leave her job to work with me at RCI, realizing a dream I’ve always had to work together with my spouse. I didn’t ask her to do this, it was 100% her idea. Fast-forward to today, Darlene runs RCI and I like to call myself semi-retired. I still devote significant time to RCI continuing to refine our trainings, directing the marketing and providing mentoring for our members, but more of my time is devoted to our lifestyle, as you will soon see. Between 2008 and 2014 when we wrote and published Radical Marriage we had the greatest time exploring our relationship, experimenting with strategies for continually co-creating the most extraordinary life and relationship possible for both of us. After the publication of Radical Marriage we both got absorbed in the business of everyday living and running RCI together, and found ourselves in the normal pattern of most couples by reactively focusing on our relationship when one or both of us was feeling disconnected or getting off track. Neither of us wants to slide backwards in our life and relationship. Thank goodness we had the tools, awareness, and motivation to quickly get back on track. Then, in 2016 the youngest kids went off to college and we finally had an empty nest. Having talked a lot about our vision for our future, it was finally time to make a decision and take action. We sold our house to get our dream boat to become live-aboard cruisers living full time on the water and going wherever in the world we want to go. Fast forward to today, we have been living full time on our boat for two years, dividing our time between updating and upgrading our boat for extended cruising, and exploring the central coast of California and San Francisco Bay as cruisers, getting to know our new (to us) boat, living “on the hook” (anchoring rather than tying up to a marina dock) and preparing for leaving the area where we’ve both spent most of our lives. All the while continuing to advance RCI into the future with new products and programs. 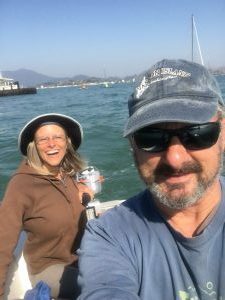 We both look forward to our cruising lifestyle and love that we can work wherever we have a cell phone signal, which is most of the U.S. west coast where we want to be anyway. Eventually we’ll retire and end up in the Pacific Northwest in more remote places without a cell signal (places like Desolation Sound) and turn RCI over to the next generation. As I reflect on our (“radical”) marriage I am awed at what we’ve accomplished together, where we are and where we’re headed. We live on the leading edge every day and love our life together, including the challenges of our highly inconvenient lifestyle (going grocery shopping can be an all day excursion once every other week or so). I feel incredibly lucky to have found my soul mate in Darlene, but on the other hand it wasn’t “luck.” Having learned about dating and relationships the hard way and publishing Conscious Dating in 2005 led me to Darlene in a very direct, conscious, mindful way. She is the most loving, accepting, positive, responsive, hard working, adventurous woman I’ve ever met and a fantastic match who appreciates me and how I show up in our relationship as much as I appreciate her. We are both quirky and love and accept each other’s quirks. We’re still working on Darlene’s seasickness by experimenting until we find the solution that addresses the symptoms without putting her to sleep. Even so, Darlene regularly and spontaneously exclaims, “I love living on a boat!” She loves being rocked to sleep at night, experiencing sunsets and nature all around us, calling dolphins and sea lions “Baby,” visiting cool places for as long as we want to stay, and even the challenges of living on the water full time without a car. Going forward we will continue to enjoy our Radical Marriage, our work, and we look forward to the next phase of our radical life together.